Come on. If there were 10 characters, select would be fine. There are 36, which, as best I can tell, is every single character in CW that isn't a legendary, plus QGJ, who wasn't even really in CW (CW takes place between movies 2 and 3 -- his force ghost is in the shows, but, that's like putting Jedi Knight Anakin in a celebration of A New Hope). Also not in the show: Sun Fac or Zam. We can excuse Jango not being in the show because a) he's a brand new character we all want, and b) the show is about his clones so he's sorta in there. Yeah, anyone who interpreted it to be just those 3 characters should have re-read it, I was expecting something like 6 total, one for each node. If there were 10 important CW characters you could pull from, that would also be ok, but this isn't. 'Select characters featured in the animated series' really shouldn't include CS, JC, JKG, GSol, GSpy, at the very least, because they are in no way featured in the show -- they're all background characters. The more important point here is that CG hyped this so that people would think it would be worth their time (and crystals), but it's the worst version of bonus drops we've gotten to date. Is this bonus shards event open for anyone yet? Any Australians here? Does it start the beginning of the 9th or the end? It started for me at refresh (midnight QLD time). The mod battles should turn yellow. Don't worry though, you're not missing much. Oh woah I missed the angry mob that’s formed over this being a very laughable event. Luckily I’ve only played since February so I still don’t have very many at 7*. Hopefully the drop rate is decent. Just forget the bonus drops. Don't drop your crystals in useless refreshes. iI missed instead the double currency on special mission i light side bt... where were them?!? (of a group of people or things) carefully chosen from a larger number as being the best or most valuable. "In celebration of the 10th anniversary of Star Wars: The Clone Wars, for a limited time, all Mod Battles Stage 9 nodes may also award bonus shards for select characters featured in the animated series, including General Grievous, General Kenobi and Jango Fett. These bonus shards will be available from 11/9 to 11/11." Including refers to the characters selected, not from ALL characters featured in the animated series. It's not about skimming, it's about what they said. This means that either they do not know the meaning of the word, or that they misled us intentionally. Take your pick! I already wasted 800 crystals to stock up for it... It's my fault for believing that EA is honest. There are characters in the series that are not in the game. Which means it is not intentionally misleading because the characters listed are of a sub set of all characters from the animated series. Yes it could have been worded better, but it's not intentionally leading anyone to do anything. Your choice was to spend the crystals based on believing that the set of toons available would be smaller than it is, but that is inferred from what is stated. It may not be the best situation but the set of characters could have been any number from how its worded, would you have been happy if it was one or 2 less? From the wording it could have been....it still would not have been what you wanted. Come CELEBRATE by getting 2-4 shards of characters you don’t already have at 7* over a period of 3 days!!! I’d probably feel more benevolently toward CG over this if it didn’t follow on the heels of their last bonus shard communication debacle, in which they misstated the start date of the event, leading people to waste a bunch of energy. We now have a pattern of the devs posting false or misleading info about the events. A reasonable way to have advertised this event would have been to post something emphasizing Jango, GK, and GG a week out to build up excitement, and then, a couple of days before the launch, follow up with a post containing the full details. This is, after all, the first time that a bonus drop event has had a loot box mechanic, rather than having each character tied to a specific node. I definitely assumed, admittedly without thinking too hard about it, that the named characters were 3 of 6 that would be available, each on a separate mod slicing node. I wasn’t planning to change my farming habits to take advantage of this, but I can understand how somebody who was planning to take advantage would be disappointed in the communication around this event. Frankly, I think people would be a lot happier with no advance communication at all of bonus drops than with communication that only serves to mislead them into wasting resources that would be better spent elsewhere. Question: If a player sims multiple runs which awards a box, do the reward boxes stack or is it only one award total. Does that make sense? If I sim a single node and win a box, does it open the bonzium roulette wheel to tell me my prize or is the prize calculated as soon and the rewards portion opens. If I sim multiple times in a single turn do all prize boxes won open immediately or individually the roulette wheel opens like when spending multiple ally points. I found a dollar the other day, which helped me buy a car which helped me getting a job that requires me to drive around alot. Getting 1 dollar for my birthday still wouldn't get me excited, just like bonus drops on nodes. It's cool and all because it's free/extra, but that's about it. imo these type of aniversery events are successfull if players are willing to spend a bit more (crystals, energy, money or w/e it is that is extra rewarding during the event) to get some more. With this one there's very little incentive to spend some more to get some more, which has generally been the case with bonus drop on nodes events in my experience. i'm happy for you those bonus bossk shards helped you out though. That doesn't make it better. if you had read this post clearly, the point is the chances of getting one of those three shards is very slim. You most likely get shards for toons you already are done with. What happened to the zetas for JKA, GK, and Rex? I’m guessing we get a bonus Zeta tomorrow for the 3rd anniversary of the game. Probably some gear too. The stun gun will be from a selected pool of stun guns including the much needed Mk. 5 Stun Gun! So I bought the Mod energy pack just to see what I would get from 900 energy. As you can see it's nothing special. In this picture Poggle and Clone Sergeant are 1 shard each. What you can't see but I also got is 5 shards of Geo Soldier, 2 of Plo Koon, 1 of Kit Fisto and 1 of Jango Fett. Come on kyno - no reasonable person is going to take “select set” to mean “literally every CW character.” There’s really no argument that the wording was very misleading even if you read it closely. 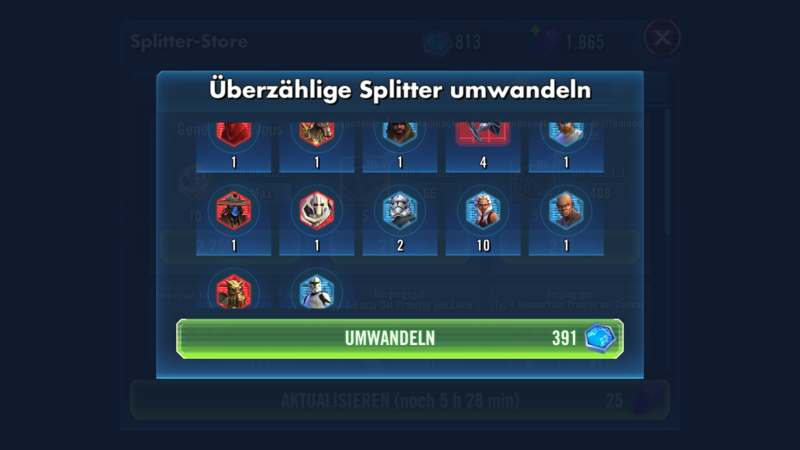 I got a nute gunray, dooku and poggle shard from a 2refreshes. Gonna be one heck of a celebration guys! As predicted the drop rate is ridiculously terrible. Yay, 'celebration'! To be fair, they never specified who the celebration was for.